Buy Allergenics ® Intensive Care Cream - 50ml in the UK from our online shop or directly from our independent Scottish store. Non-steroidal, naturally effective and free from preservatives, this intensive care cream is suitable for people with very sensitive skin. Allergenics Cream is a nourishing and protective moisturising emollient for delicate skin, developed using hypoallergenic ingredients which significantly reduce the risk of allergic reaction. We sell real Allergenics and other Problem Skin directly from our shop in Scotland and online throughout the UK. View more products from Allergenics. 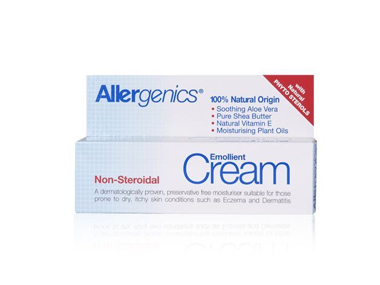 Where can you buy real Allergenics Cream safely online? If you are wondering where you can buy Allergenics ® Intensive Care Cream - 50ml safely online in the UK, then shop with us. We are an actual health foods shop; with real people selling real foods and products. Our award-winning independent shop is located in Stirling, Scotland since 1976. You can buy our Problem Skin in store or safely place an order with us online or over the phone. Allergenics Cream - Allergenics ® Intensive Care Cream - 50ml in Problem Skin and Medicinal Skin Care.